A new infusion of tagged manatees will help scientists understand how these gentle giants use coastal Georgia waters, especially near Kings Bay submarine base. 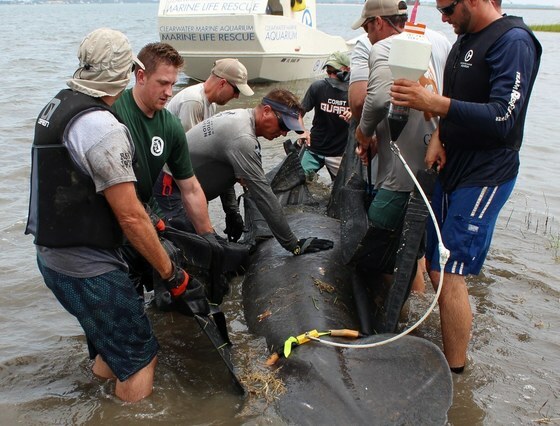 In the project led by Sea to Shore Alliance, Georgia DNR's Nongame Conservation Section and Georgia Aquarium, eight manatees were caught, fitted with GPS transmitters and returned unharmed to Cumberland Sound May 31-June 2. Two of the 13 manatees tracked the past two summers are also still transmitting. That’s good news for the effort to map movements of the threatened species near Naval Submarine Base Kings Bay, document migratory paths and habitat use in the region, and collect baseline data to help assess manatee health. Understanding habitat use and migration details can benefit conservation efforts. The GPS-precise tracking has shown that manatees regularly venture into the submarine base, they’re able to find artificial freshwater sources to drink from, and a few have traveled into the open Atlantic (2016 project video). Biologists are also confirming things they long suspected but had no way to prove, such as the importance of the Intracoastal Waterway for manatees moving along the Georgia coast. “The Intracoastal Waterway is like a manatee highway,” DNR wildlife biologist Clay George said. But it’s also a primary route for boats, placing manatees at added risk of boat strikes, a significant cause of mortality death. Read more about the project. See photos. Manatees were federally downlisted from endangered to threatened in March. Of 13 previously tagged for the project, only three have traveled the length of Georgia’s coast. The eight fitted with transmitters this year included two females, the study’s first. “Females use habitat differently than males, so it will be exciting to gather their movement data,” said research scientist Monica Ross of Sea to Shore Alliance. The transmitter, tethered to a belt, floats behind the manatee and does not impede movement or pose a risk of entanglement. 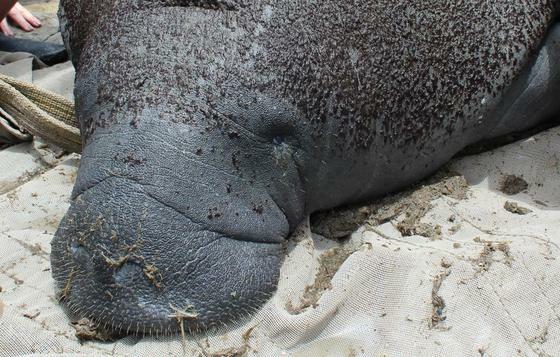 If you see a tagged manatee, report it to DNR at 1-800-2-SAVE-ME (800-272-8363). Note the time, date, location, tag color and if other manatees are present. Do not touch the tag. It is illegal to chase, touch or otherwise harass a manatee. Manatee recovery is a high-priority action in Georgia's State Wildlife Action Plan, a comprehensive strategy to conserve native species and natural habitats before they become more rare and costly to conserve or restore. Help conserve manatees and other rare species by purchasing or renewing a DNR eagle or hummingbird license plate – only $25 more than a standard plate and $19-$20 of that fee goes to conserve nongame. The musical entertainment at my house this time of year ranges from cardinals and gray catbirds by day to whip-poor-wills and chuck-wills-widows at night. But there is one champion songster whose skills are often unnoticed or misattributed – the brown thrasher. Although known as Georgia’s state bird and common in backyards across all 159 counties, the brown thrasher’s musical talents are largely unappreciated. Reasons why include brown thrashers often sing out of sight – in thick shrubbery or vines -- and casual listeners often mistake their songs for those of northern mockingbirds, which prefer to sing in the open. 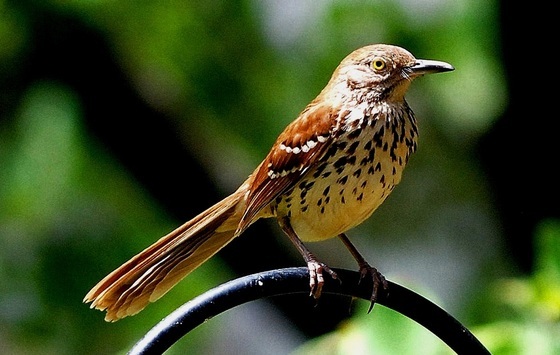 However, to those who recognize the subtleties, the brown thrasher's vocal talents exceed the mockingbird's. Read Terry’s column for a greater appreciation of our state bird. 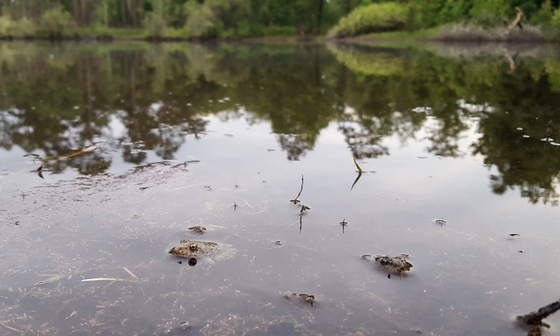 Some 70 years after the people of Paulding County created a wildlife reserve as a place to hunt and fish, Paulding Forest and Sheffield wildlife management areas are now a premier public site for hunting and fishing, as well as for birding, biking, hiking … and even for rare species. Read “A wildlife gem in the shadow of a booming Atlanta,” a blog post by the U.S. Fish and Wildlife Service’s Dan Chapman, to see how officials are working to manage the natural resources and outdoors recreation these WMAs offer in an increasingly urban landscape. The nest outlook for southeastern American kestrels in Georgia is encouraging. The number of nesting attempts at boxes DNR monitors is more than double compared to the previous four years (“Eye on the sparrow hawk,” June 16). Kestrel nest boxes attract more than birds. 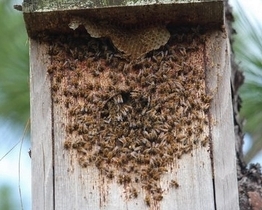 DNR’s Ashley Harrington moved this box turned honey-bee hive on Sandhills West Wildlife Management Area to a nearby longleaf pine, and plans to install another box that will hopefully become a home for kestrels. Sea turtle nesting is off to a strong start. More than 950 loggerhead nests have been documented on the state’s barrier islands, with May's total of 511 nests ranking second only to May 2016, part of a record season. This year's count also includes a probable nest each for green, leatherback and Kemp’s ridley sea turtles, Georgia rarities. After an early surge, sea turtle strandings in Georgia are tracking below the 28-year average, with more than 80 reported through early June. Using standardized surveys, DNR documents sea turtles that wash up on the beach or strand as a key index to threats the species face in near-shore habitat. Call 800-2-SAVE-ME (800-272-8363) to report sick, injured or dead sea turtles. 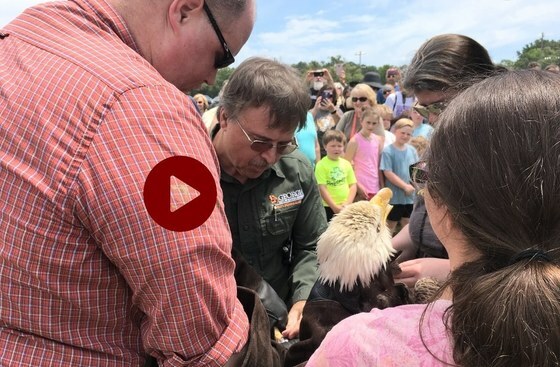 A rehabilitated bald eagle released at West Point Lake May 27 ruffled a few feathers. Nongame Program Manager Bob Sargent, who banded the eagle before Southeastern Raptor Center released it, noticed an osprey nest at the site when he arrived, but knew that while ospreys will harass eagles, they seldom hurt them. When the eagle took off, an osprey swooped in – “a fighter plane going after a B-52 (bomber),” quipped Sargent – but the eagle kept going. Watch the video. The released eagle wasn’t the one originally scheduled for return to the wild at West Point. During a final check of the initial bird, found hurt near LaGrange last year, the Southeastern Raptor Center ruled it wasn’t ready; but another picked up by DNR in Jakin this February and treated by the center was. Interior Secretary Ryan Zinke’s announcement that the U.S. Fish and Wildlife Service is distributing $1.1 billion to state wildlife agencies highlights the impact hunting and fishing have on conservation and outdoors recreation. Dedicated to wildlife and derived from excise taxes on guns, bows, ammunition, fishing tackle, some boat engines and small engine fuel, the revenue is split among states largely according to license sales. Georgia’s share for fiscal year 2017 is nearly $30 million. Boating and fishing access is easier on the Flint River and at Big Lazer Public Fishing Area near Talbotton, thanks in part to those federal sport-fish restoration funds. DNR replaced a log ramp with an upgraded version where Ga. 32 crosses the Flint in Lee County, and added a hand-launch area and canoe steps on Big Lazer, entrances to the Flint and Big Lazer Creek. 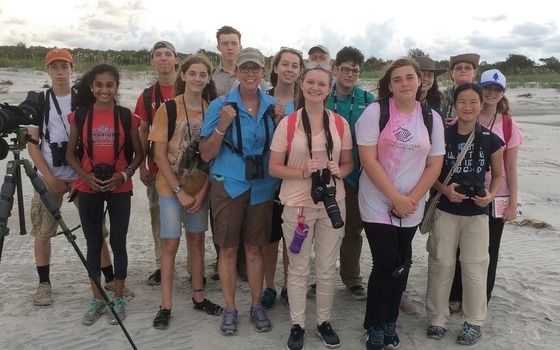 Camp TALON teens reached the beach and beyond last week, visiting wild sites from Little St. Simons to Fort Stewart, identifying about 120 bird species, and seeing an eastern diamondback rattlesnake, a glass lizard and scores of butterfly species. Plans are already in the works for the 2018 camp and an ecology-infused syllabus that explores habitats, rare species, geology and more. The family group of red-cockaded woodpeckers at Silver Lake Wildlife Management Area near Bainbridge has budded, or split from one territory into two. A male from the group joined a female translocated in 2015 from Florida. That gives Silver Lake 30 potential breeding groups of the endangered woodpeckers, a point at which the population is stable enough to no longer receive translocated birds. 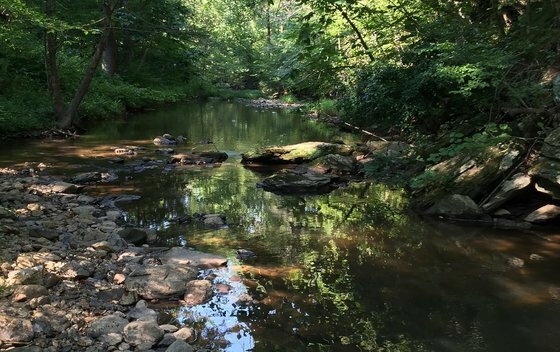 Plug into the U.S. Forest Service’s effort to plan management of Chattahoochee National Forest foothills for rare species, nongame, sustainable recreation, reduced risk of wildfire and improved soil and water quality. Details at Foothills Landscape Community Collaboration. DNR's Dr. Mincy Moffett and Kevin Lowrey discuss habitat management in this video of a Foothills field trip. Names in the news: Dr. Brett Albanese has been promoted to program manager at the Nongame Conservation Section’s Social Circle office. Albanese, an aquatic zoologist, has worked for DNR for more than 14 years, serving as a senior biologist for the past 12, supervising nongame aquatic research and survey programs, and working throughout the Southeast to prioritize research, survey and conservation efforts for imperiled aquatic fauna. Albanese fills the position left vacant by Matt Elliott, Nongame Conservation Section's new assistant chief. July 10 -- Family Day at the Range, 10 a.m.-3 p.m., Wilson Shoals Wildlife Management Area Shooting Range, Gainesville. Limited to 10 families. Aug. 21 -- Ladies Day at the Range, 10 a.m.-3 p.m., Wilson Shoals Wildlife Management Area Shooting Range, Gainesville. Limited to 10 participants. Released gopher frogs settle into their new home at The Nature Conservancy’s Williams Bluffs Preserve, part of a long-running effort to re-establish a viable population of the imperiled frog species at the southwest Georgia preserve. The frogs were raised by UGA and the U.S. Fish and Wildlife Service’s Warm Springs Hatchery from eggs collected at Sandhills East Wildlife Management Area (“Egg mass,” Feb. 24). Other project partners include The Amphibian Foundation, Blue Heron Nature Preserve and Joseph W. Jones Ecological Research Center. 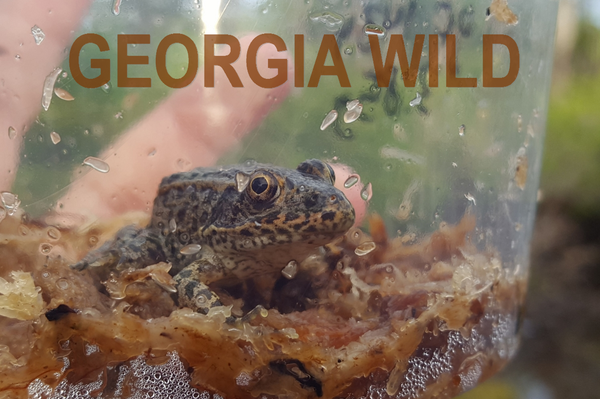 Gopher frogs are state-protected and a Georgia Wildlife Action Plan conservation priority. The gopher frog’s call has been likened to a long, deep snore (listen).